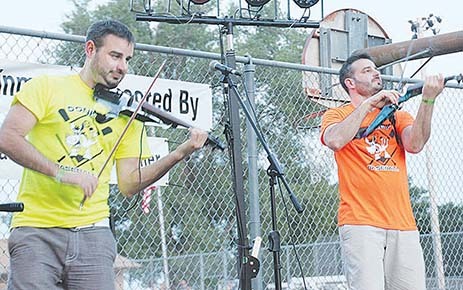 SYNERGY TWINS — Twin brothers Stephen and Jeff Neil, electric violinists, provided outstanding entertainment at Pivot Days in Lindsay last Friday night. The community of Lindsay celebrated its first annual Lindsay Pivot Days this past weekend. The event saw a great turnout for all activities. 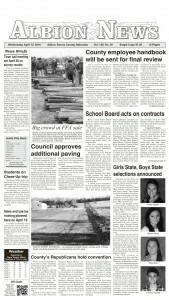 On Friday, 600 people took part in the meal and 750 people came out for donkey ball and fireworks later in the evening. The Synergy Twins violinists entertained prior to fireworks. Saturday also showed great numbers with over 700 runners in the Fun Run. There were 48 different entries for the parade. A water fight took place for three hours on Saturday with a lot of participants. There were 16 sand volleyball teams competing in the tournament, and over 700 people attended the dinner on Saturday. 90 Proof entertained in the evening to a large crowd, despite the rain showing up around 11:30 p.m.
All entertainment and activities were free of charge to guests due to the numerous contributions given by sponsors. The second annual Lindsay Pivot Days will take place June 28 and 29, 2019.